South African Tourism and the National Geographic Channel have launched a global search for the world’s top adventurers. This is the second edition of the competition, titled Adventurers Wanted. Based on the overwhelming response to last year’s inaugural event, which cements South Africa’s reputation as one of the most thrilling adventure destinations in the world, the search has been expanded to include not only the UK as it did in 2009, but also the US, Australia, France, Germany, Italy, Netherlands and India. The eight winners – one from each country – will go on a seven-day adventure tour of South Africa and afterwards become travel ambassadors, promoting the various outdoor activities available in the country. A host of gruelling activities await the intrepid group. These include hiking, surfing, wildlife-tracking, canoeing, shark-cage diving, quad-biking, bush-walking, safari, bungee-jumping, paragliding and hot-air ballooning. As they progress, the team will document their adventures for National Geographic’s global audience, through a range of media – online, print and video – to showcase South Africa’s diverse travel opportunities. The competition’s website already offers enticing interactive features such as a clickable map of South Africa, screensavers and wallpapers, online games, and videos and images of last year’s event. Entrants can whet their appetites with stunning images of the country taken by professional National Geographic photographers. Men and women between the ages of 22 and 45 are eligible, and entries close on 22 June. National Geographic vice-president of media partnerships Deborah Armstrong said that the nature and travel publisher was delighted to be extending the long-standing partnership with South African Tourism into 2010. “It’s extremely exciting to be taking the campaign to the next level this year through the inclusion of multiple National Geographic Channel regions,” she said. 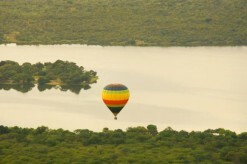 According to South African Tourism, the country is the ideal destination for those seeking adventure. The initiative is spearheaded by cameraman and author Paul “Mungo” Mungeam, who participated in the inaugural event. South Africa ranks consistently as one of the world’s top destinations, boasting numerous different types of terrain and remarkable scenery that provide extensive adventure possibilities. Although the safari holiday is synonymous with the African continent, South Africa is known for much more than just breathtaking game-viewing. It’s also one of the best places for rock-climbing, abseiling, base-jumping, caving- and cave-diving, spectacular hiking, horse and 4×4 trails, river-rafting, skydiving, kayaking, scuba and shark diving, para- and hang gliding, ballooning, and many more. Options are not just limited to novice travellers – in fact, South Africa offers something exciting for even the most experienced of explorers. All activities are overseen by reputable operators, many of whom can also arrange a complete travel package. Cape Town’s Table Mountain is popular for rock-climbing and related sports, and is the scene of many a brave climb or leap. All routes on the mountain still lie within the city limits. Other locations, such as the mountainous Mpumalanga region, also offer a variety of hikes and climbs for all levels of fitness. The country is home to the third highest commercially operated bungee jump in the world. The 216m jump off the Western Cape’s Bloukrans Bridge is not for the fainthearted – nor are the cold waters off Gansbaai in the Western Cape, known as Shark Alley because of the abundance of great white and bull sharks found there. The 2 300km-long Orange River is just one of the many waterways around the country, although its muddy waters are calmer and less demanding than the Doring River in the Western Cape. This fast-flowing river swells in winter and is regarded as offering some of the best white water in the country. For those with a more leisurely preference, there are less demanding options such as hiking through the bush, horse-riding along sandy beaches, standing thigh-deep in quiet rivers waiting for the trout to bite, hitting the ball down the fairway as wild game looks on, or simply relaxing in the bush on a wooden deck at sundown.